The Prime Minister’s remarks came during a meeting of BJP parliamentary party, which felicitated Modi for defeating the no-confidence motion. 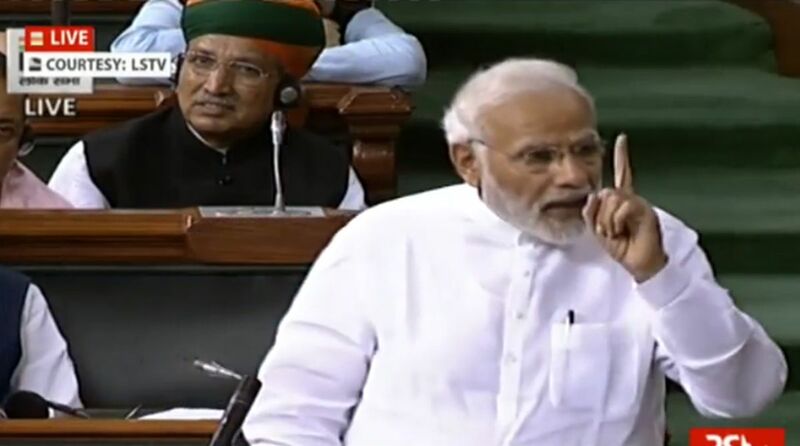 Prime Minister Narendra Modi told BJP MPs on Tuesday that he was “thankful” to the opposition parties for bringing a no-confidence motion against his government which, according to him, provided the ruling dispensation an opportunity to expose their political “hollowness”. “The Prime Minister double-thanked and gave multiple compliments to opposition parties which brought the no-confidence motion and helped the ruling party to bring before public its achievements and pro-poor policies. It also provided an opportunity to expose their hollowness,” said a senior BJP leader who was present in the meeting. The Prime Minister also said that at this stage no political party would have moved the motion. “The BJP and NDA utilised the opportunity provided by the immature opposition parties. This has given us a chance to explain the success story of NDA to the whole nation,” the BJP leader quoted Modi as saying. Talking to reporters after the first BJP parliamentary party meeting in the ongoing Monsoon Session, Parliamentary Affairs Minister Ananth Kumar said the opposition brought the no-confidence motion despite knowing that the numbers were not in their favour. The motion was defeated by 195 votes. “They used the occasion to target us without facts and figures. Their hollowness was exposed before the people,” Kumar quoted Modi as saying. Kumar said that Modi also praised Union Home Minister Rajnath Singh’s speech on the motion and asked party members to take it to the people. Besides Modi, BJP chief Amit Shah, External Affairs Minister Sushma Swaraj and Land and Transport Minister Nitin Gadkari addressed the meeting.